Last week, I had a review meeting with MAQE, the digital agency that is working on finishing the final features of our new TIPS online personality test platform in a series of implementation sprints. When the development team walked me through the redesigned user environments for the different user types of the platform, I was delighted that TIPS end users now can see a new dashboard, which shows both the test results and profile history of any user who takes the test more than once. “Wait a minute”, you might interject, “isn’t my test profile in TIPS always the same? Isn’t personality fixed and something that is stable over time?” Well, it is, and it isn’t. Let me explain. 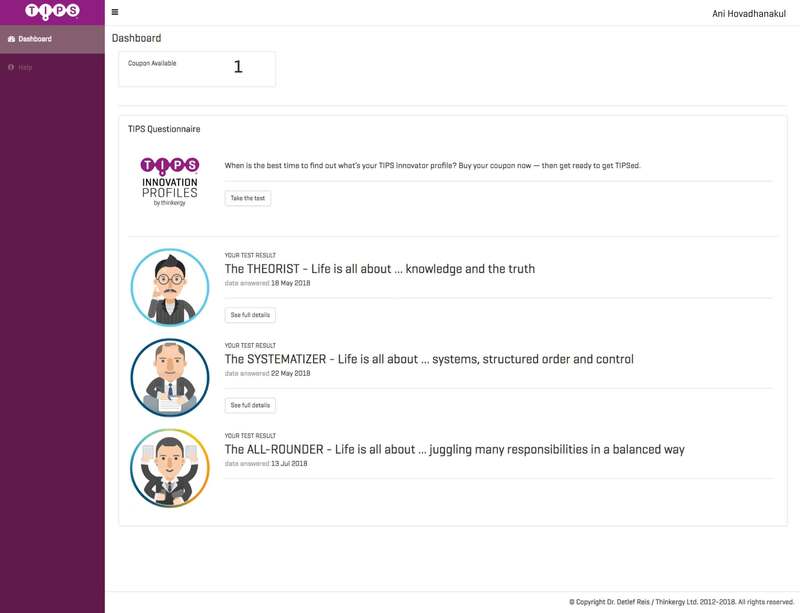 TIPS is a new cognitive profiling method that I’ve developed to help people understand how they may better contribute to business and innovation performance by doing what they find naturally easy and enjoyable to do. 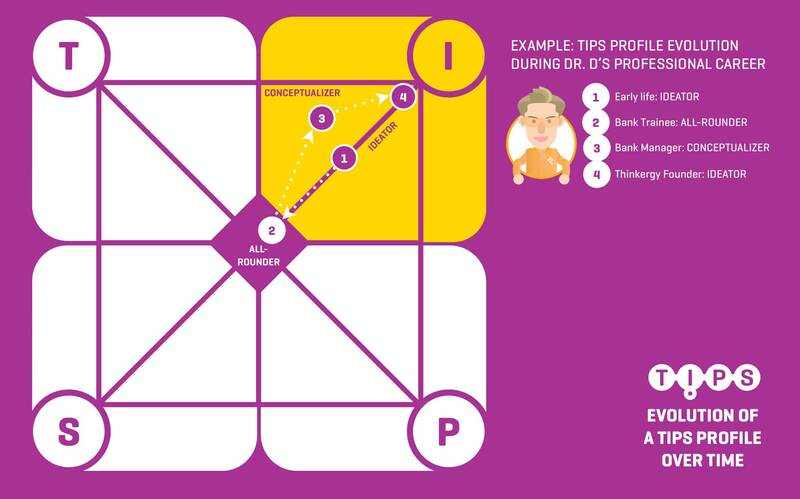 With the help of 60 questions, we identify a person’s preferred styles to think, work, interact, and live, as well as which of four TIPS bases (Theories, Ideas, People, Systems) attract them. Based on how a person’s answers the 60 test questions, we then compute the test result and then link it to one of 11 innovator profiles that at this point of time best reflects a person’s self-perception. 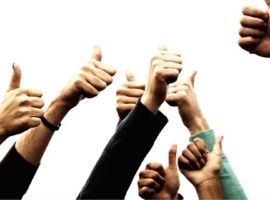 Many people end up with the same TIPS profile if they take the test repeatedly over time. But a person’s TIPS profile isn’t necessarily static. For some people, it may change dynamically and evolve over time, thereby reflecting the situational context of their work at different points in time during their career. But even if a profile changes over time, it will only be 1-2 steps removed from its true position exhibited under ideal conditions. Let me try to illustrate these points by taking you on a little excursion into my professional beginnings, and how it would have reflected in TIPS. In TIPS, I profile as an Ideator (nowadays in an extreme expression), which accurately reflects my preferred styles and natural interests. However, had I been able to do the TIPS test earlier in my professional career (which of course, I wasn’t because I hadn’t developed it yet), I would have likely profiled as an All-Rounder or Conceptualizer. I am fortunate in having been born in a small town in the West German countryside at a time of relative growth and prosperity. Showing talent in schoolwork and on sports field, my early life was easy, effortless and enjoyable. Then, while doing my mandatory military service, my Dad passed away all of a sudden. For the first time, I felt the serious aspects of life. Instead of going on to study after my military service, I felt inclined to first get a solid work background in a respectable, safe career environment. I was fortunate to land a job in Germany’s most prestigious bank, and began a 2-year bank traineeship at Deutsche Bank’s Idar-Oberstein branch near my hometown. 3 months into my traineeship, I received my first performance evaluation. It was devastating, self-confidence-crushing, and —for someone who so far in life had always come out near the top— humiliating. I realized that to survive in this traditional, conservative and serious work environment, I had to quickly and drastically adjust my preferred styles and behaviors. I did, learned how to fit in, and completed my traineeship successfully. Having become a state-certified bank professional allowed me to finally realize my study ambitions. I enrolled to study business administration at Saarbruecken University, which I paid for by working part-time in Deutsche Bank’s regional branch there. I became a “floater” in the retail banking division, filling-in for colleagues on vacation or on sick-leave at different branches and in different roles. Later on, I also funded my Ph.D. studies by working part-time in a special bank management trainee program sponsored by Deutsche Bank’s head office in Frankfurt. To rise to the multiple challenges during my early work years in Deutsche Bank, and perform well in the various roles, departments and locations I was assigned to, I evolved into an All-Rounder — and would have likely profiled so had I been able to take the TIPS test at that point of time. After I had completed my Ph.D., I positioned myself in Deutsche Bank’s Corporate Banking Division in Asia, where I’d heard the internal work environment is more relaxed, fluid and dynamic. As a result, I was able to work more closely to my natural home base in TIPS (Ideas). By coming up with creative financial structures that solved problems of my corporate clients, I quickly earned their respect, won deals and made money for the bank. Moreover, I also created special communication tools (such as a financial country guide and a weekly newsletter with financial market updates while working in the Philippines) that helped position our team as the “go-to guys” for clients and new prospects seeking advice on the local financial markets. At the same time, due to the nature of my role, and also as many people in finance and treasury are Technocrats, I also had to engage a lot in analytical thinking (cashflow modeling, account planning, etc.). So, had I taken the TIPS test one-and-a-half decades ago while working as a corporate banker for Deutsche Bank in Asia, I would have likely profiled as an Imaginative Conceptualizer, which is very close to the Ideator-profile that reflects who I really am and perfectly aligns with what I am doing professionally now. My personal example illustrates that situational factors may influence how you profile in TIPS. What are these factors? Work environment and professional role: Different industries, departments and organizational types vary in their ways of doing things, and are driven by different TIPS Bases (Theories, Ideas, People, Systems). For example, banking is largely systemic, while the animated-movie industry is ideas-driven; a government office is typically technocratic (Theories and Systems) while an ad agency is promotional (Ideas and People); manufacturing is operational (People and Systems) while consulting is conceptual (Theories and Ideas); a researcher is largely theoretical while a nurse is highly people-oriented. As such, the dominating cognitive styles that make you succeed in a particular work environment (or a professional role that relates to it) may reflect in your TIPS result, although deep down inside, you may prefer other styles. Social environment: The socio-economic environment in which we get socialized and educated during our formative years influences the views and styles that we develop. For example, becoming an entrepreneur was never on my mind as a kid, because the social fabrics in my rural social environment neither encouraged risk-taking nor celebrated entrepreneurs as positive role models to emulate. What if I had grown up in Silicon Valley instead? Well, we don’t know, but chances are that I would have become one of the founders of a technology start-up during the Dot Com-era (and been aligned to my “natural” profile as an Ideator early on). Work experiences: The more work experience you have, the more accurate and consistent is your TIPS profile likely to be. Why? By design, many questions of the TIPS test flash out certain work-related scenarios to capture people’s actual styles and preferences in real-life situations. For career starters lacking a sufficient repertoire of work experiences (say, at least 2-3 years), their “naive” test answers may result in a profile that isn’t reflecting their true essence accurately. Self-image and truthfulness: Your answers to the TIPS questionnaire capture who you say or believe you are at the moment of testing. Your resulting profile may or may not be accurate, depending on how truthfully you have answered each question. But why should someone “fake” an answer? We discuss this point in the following. TIPS conceptually connects to certain aspects of Genius Journey, Thinkergy’s creative leadership development method. At the second level of Genius Journey, many people are prevented from reconnecting to their creative flow by their egos (or false selves); in contrast, truly creative people insist upon being themselves and being original. How does this relate to capturing a person’s personality with a cognitive profiling test like TIPS? Typically, young children show their true colors of who they really are. By latest during adolescence, their original personality begins getting distorted in the socialization and education process, and they start to develop ego. People under the influence of their egos wear a social mask. They play a role that reflects the expectations of others and helps preserving a certain external reputation, which is based on “labels” that others assign to them (for example, when I came to work in Asia with a fresh Ph.D., some labels that colleagues and superiors wrongly stuck onto me were “academic” , “analytical” and “intellectual”). Our ego tends to nurture these labels in negation of our true inner core. No wonder some people answer certain questions of a cognitive profiling test in a biased or intentionally untruthful way. Why do they do this? 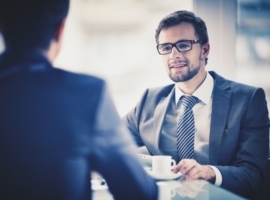 They believe this misrepresentation of who they really are may please their boss or partner, or makes them fit in to an incongruent environment, or allows them to “get ahead” with their careers. When doing a cognitive profiling test like TIPS, only you can decide to answer each question truthfully — and it’s in your own best interest. If a person intentionally “fakes” an answer to one of the TIPS questions, they may benefit in the short term (by pretending to be a person that lives up to the expectations of others) but harm themselves in the long term (because making a career in roles and ecosystems that don’t align with one’s true personality is distressful, drudging and de-energizing). So, it’s best to be true to your own self and not fake an answer. Having said this, I have already begun working on the next version of TIPS (“TIPS 3.0”), which in its premium-version will include a construct that allows us to reveal if a subject answers too many questions in a way that misrepresents who they really are. This will enable a certified TIPS coach to follow-up and probe for the background of this incongruences in order to help such a person find their true profile in TIPS. However, before we release this next version of TIPS (ca. 2020), we will collect more data to allow us to test the hypotheses underlying this conceptual construct. 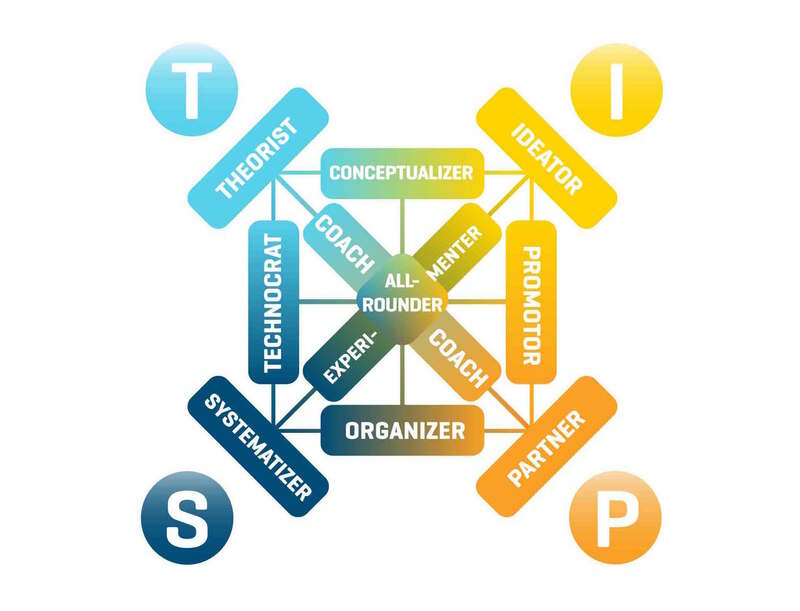 Have you become interested to get TIPSed and find out what is your TIPS innovator profile? Then, contact us and we will let you know once our new TIPS test platform will go live in a few weeks from now. 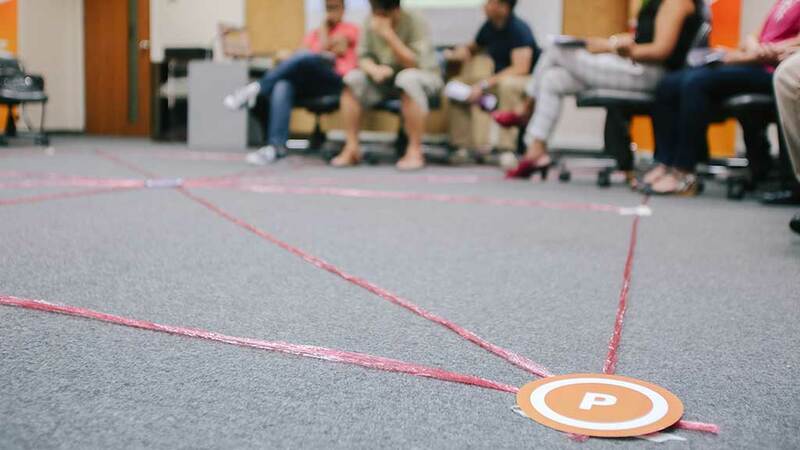 Previous article How to effectively and creatively develop creative leaders?